THE new Audi A8 has a powerful 3.0 TFSI, 500 Nm of torque, and 340hp engine. It’s not the most powerful car in its class. Its basic proportion remains sleek, understated, and sophisticated looking. To the untrained eyes (and most chauffeured passengers) you may not pick up on the latest visual cue from the outgoing model. But that’s okay. In the top end segment, cars like the Audi A8, or the BMW 7 Series, Mercedes-Benz S Class, to name a few, are more about the proper balance of power, handling, comfort – all the high-tech features and high-end interior furnishings that matters more. The Audi A8 is the perfect luxury limousine for those who want the utmost in comfort without drawing too much attention. Here are six fun facts and features to help you enjoy your ride in the fourth generation Audi A8. This is one car you’ll probably enjoy being driven as much as getting behind the wheels. The updated model now measures 5,172 millimeters long, 1,945 millimeters wide and 1,473 millimeters tall. It has grown 37 mm longer and 13 mm higher than its predecessor, while the width is shorter by 4 millimeters. The spacious cabin benefits the passengers. In length, the interior has gained an extra 32 millimeters compared with the predecessor model. The A8 L also has more headroom, shoulder room, and leg room. The luggage compartment has a capacity of 505 liters in both the Audi A8 L and the A8. Audi says the interior of the car resembles “a spacious lavish lounge”. And the best seat in the “house” or the A8 in this case, is behind the front passenger. The model we tested was fitted with an optional relaxation seat. The relaxation seat can recline and feet can be rested on an electrically folding surface on the backrest of the front passenger seat. This provides the option of having the feet warmed and massaged with multiple settings. In each seat’s backrest, there are as many as 16 bubble-shaped air chambers that can be activated to relax your muscles. You have a total of seven different programs to choose from with three intensity levels to target those muscles from your back to your neck. You can also massage and warm the soles of their feet, electrically height-adjustable comfort head restraints, footrests, among many other features. The wellness massage feature in the A8 was built in collaboration with physical therapists, osteopaths, and physicians. In addition to pneumatic seat and backrest side bolster adjustment, it also comes with heating and ventilation, each with separate three-stage control. Controlling the functions of the car is akin to playing with your smartphone; it’s user-friendly with familiar operations. For example, when your finger touches an icon, the graphic reacts either with a colour change or animation. As with a smartphone, many icons come with long-touch or long-push functions. You can make entries such as inserting a new tile in the main menu by pressing it for eight-tenths of a second – a brief vibration will then occur, and you can move the icon around. Swiping, scrolling and multi-finger gestures are also supported. Text input on the lower display accommodates successively drawn letters, in addition to entire words. There are two control screens for the driver and front passenger, a 10.1-inch touchscreen display at the centre of the instrument panel, and an 8.6-inch diagonal on the center tunnel console allows control of the air conditioning and the comfort features. If you’re climbing onto the back seats, there are three Audi tablets, two mounted behind the front passenger and driver seats. Both touch screen control pads let you control several functions including, entering navigation destinations, select media or surf over a Wi-Fi hotspot. The third control pad, the Rear Seat Remote with its OLED display, is approximately as big as a smartphone and can be removed from where it is stored in the center armrest. Some of the functions we played with include controlling the interior air quality at the setting. The ionizer and fragrance, with different intensity levels, lets you choose a scent of your liking -summer (Mediterranean notes reminiscent of the sea air) or winter (alpine fragrance suggesting mountain air). You can also electronically adjust the height for more comfortable head restraints and footrests. Rear-seat passengers can use the touch control on this new operating unit to run numerous convenience and infotainment features as well as make discreet phone calls. Infotainment is another area where the new A8 sets very high standards. The MIB 2+, the latest setup, include standard-equipped MMI Radio plus and the MMI Navigation plus with the most current modular infotainment platform. Besides a Wi-Fi hotspot that supports the new 5 GHz bandwidth, the system brings the fast standard LTE Advanced into the car – another world’s first from Audi. It enables transmission rates of up to 300 MBit/s for downloads and up to 50 MBit/s for uploads, about three times that which is currently possible. If you enjoy your tunes while on the road, the Bang & Olufsen Advanced Sound System in this luxurious carriage offers a new spatial experience. For the first time, the rear seats are included in its fascinating 3D sound with height information. The music unfolds exactly how it was recorded in the concert hall. Thanks to the Audi phone box and voice-over-LTE function, even telephony in the A8 reaches a new level both in terms of operation and the quality of the sound and connection. Automated driving may be closer than we have anticipated. 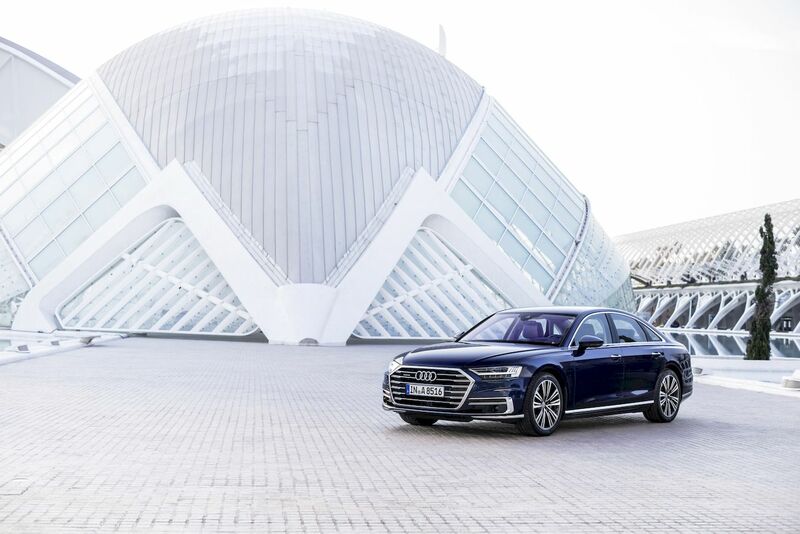 Flexing its innovation muscle, the Audi A8 L is the world’s first production automobile to have been developed for conditional automation at level 3. It means on highways and multi-lane motorways with a physical barrier separating the two directions of traffic, the Audi AI traffic jam pilot can handle driving in slow-moving traffic up to 60 km/h (37.3 mph). As compared to level 2 automation, they no longer need to monitor the car constantly and can focus on another activity supported by the onboard infotainment system, depending on the legal situations in the respective country. The driver must remain alert and capable of taking over the task of driving when the system prompts them to do so. The system can handle starting from a stop, accelerating, steering, and braking in its lane.